With big cost savings in mind, many Oracle Database customers are migrating selected applications to MongoDB. Let’s take a look at some of the factors that are driving this migration, and how MongoDB helps protect and secure data after the migration. First, how do customers protect data that is stored in an Oracle Database? Oracle Database supports Transparent Data Encryption (TDE) through a special interface implemented in Oracle Advanced Security. Once you’ve made the costly upgrade to Oracle Advanced Security, you can configure and activate encryption of the Oracle Database through the Advanced Security Wallet application. The encryption support can be either whole database encryption through Transparent Data Encryption or column level encryption. If you are using the Oracle Key Manager (OKM) solution, or a third-party key manager, the interface in Oracle Wallet is usually through a PKCS#11 interface library. This is simply a software library that uses the key manager to protect the local key used for database encryption. The increase in cost to deploy Oracle Advanced Security can be substantial. It varies depending on your licensing agreement with Oracle or one of their distributors, but it affects the cost basis for each database user. Faced with the increased cost of deploying Oracle Advanced Security, or wishing to achieve cost savings with existing Oracle Database implementations, Oracle customers are moving to MongoDB Enterprise which has a different security strategy. So, how do MongoDB customers protect data in an equivalent fashion? 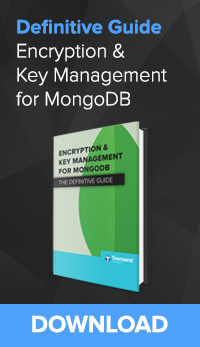 MongoDB Enterprise edition also supports Transparent Data Encryption of the database. But this is a native part of the Enterprise edition of MongoDB and does not involve additional license costs. Additionally, MongoDB Enterprise overall pricing is substantially lower that Oracle Database [Organizations are saving 70%+ by switching from Oracle to MongoDB]. Without the need for increased costs to get the encryption option, MongoDB customers are able to achieve Transparent Data Encryption in an affordable way. Additionally, encryption key management is based on the industry standard Key Management Interoperability Protocol (KMIP) as defined by the OASIS standards group. Most enterprise key management systems, including our Alliance Key Manager for MongoDB solution, support KMIP. This means that customers can easily deploy Transparent Data Encryption with an affordable key management solution that plugs into MongoDB through the KMIP interface. This will make security-conscious Oracle Database customers happy in achieving an equivalent level of security after the migration. MongoDB has been doing a lot lately to woo Oracle Database customers to its platform. While MongoDB is a NoSQL big data database, it supports SQL-like interfaces to the database. This means that migrations from Oracle to MongoDB are pretty straight-forward [A Step-by-Step Guide on How to Migrate from RDBMS to MongoDB]. MongoDB also just announced a key feature that will make Oracle Database customers happy. That announcement is that MongoDB version 4 will fully support Atomicity, Consistency, Isolation and Durability (ACID) as a core feature of MongoDB. This is database geek-speak that means that MongoDB database applications will work with the same reliability as big commercial SQL databases - something that Oracle Database customers expect. I think this will help accelerate the migration from Oracle Database to MongoDB Enterprise database. Oracle Database customers typically run a wide range of packaged and custom-built applications. I believe that early migrations from Oracle to MongoDB mostly involve those custom-built applications that are relatively simple in their architecture. Migrating from an Oracle ERP or CRM application might involve a great deal of planning and re-engineering. But I think almost every Oracle customer has some custom-built applications that are easy targets for a migration to MongoDB. The cost savings combined with the ease of migration, the equivalent level of database encryption and key management security, and the new support for ACID database reliability in MongoDB version 4 is a winning combination for MongoDB as a company. I suspect that migrations from Oracle to MongoDB will pick up dramatically this year as MongoDB version 4 roles out. Here at Townsend Security we’ve done a lot to align with the MongoDB Enterprise strategy. We’ve formally certified our Alliance Key Manager solution with the MongoDB security team, we support both Intel and Power platforms for our key management interface, we deploy in cloud, VMware and on-premise environments, and we’ve aligned our pricing and licensing strategy with the MongoDB strategy. Entry level MongoDB customers can deploy compliant (PCI DSS, FIPS 140-2) key management in an affordable manner, and key management licensing follows the MongoDB model. Even very large MongoDB Enterprise customers will be happy with our key management licensing, scalability, and pricing strategy. I am impressed with MongoDB’s goal of bringing enterprise level database technology to a wide variety of small, medium, and large Enterprise customers. It’s just the right time for a new, disruptive approach to databases. If you'd like to learn more about how we are helping secure MongoDB Enterprise with encryption and key management, visit our Alliance Key Manager solution for MongoDB page.